So, you’ve been using Google Voice for a while now. Everyone is switched to your new number, and everything works fine. But there’s one drawback: to send messages, you need to open the Google Voice app. Unfortunately, that google voice app is kinda buggy. Then, you have to hide the messages app so you don’t accidentally send messages with it instead of Google Voice. However, if you’ve jailbroken, there’s a plugin that will allow you to integrate Google Voice into the Messages app. To download it, Open cydia and search for SMS GV Extension. Install the first result. You’ll get a trial, but it’s a good idea to get a license as a couple of times a day it will remind you asking you to buy a license. Purchase isn’t as simple as it should be, but you can read the detailed purchase method by clicking here. Aside from the purchase of a license, setup is unfortunately not as simple as it should be. 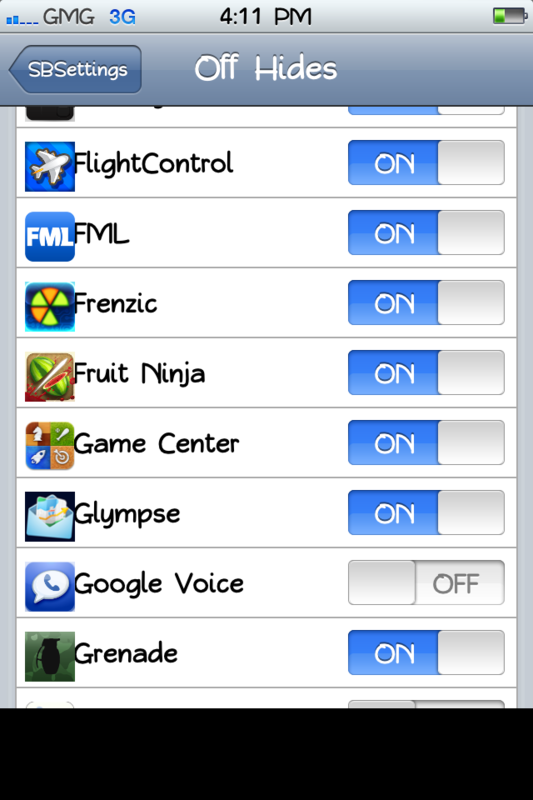 Open Settings>SMS GV Extension. Here, put in your Google credentials and turn the send box to on. For receiving, you’ll actually have to have the official app installed and working – so don’t go uninstalling just yet! Go into Receive settings and turn on Official GV App. You should now be able to send and receive texts through the Messages app. Functionality wasn’t too reliable, but after a little while it started working 99% of the time. Okay, now you have Messages working. But you still want to get rid of the darned Google Voice app! Instead of moving it to a folder somewhere secret, you can actually use a free app from Cydia to hide it. The app is called SBsettings. It’s primary use is that you can swipe across the status bar (the bar with the time and battery at the top) and toggle WiFi, 3G, and more. But it can also hide apps. To download it, just search SBsettings in Cydia and install the first result. Once that’s installed, swipe across your menubar and click “more.” Here, scroll down and find “Hidden Apps.” Scroll down in the list and turn off Google Voice. You’ll never know it was there! So now you’ve gotten messages done. But what about phone? It’s actually much easier to get the phone to work. Search in Cydia for GV Phone Extension. It’s made by the same creator as the Messages integrator, and it’s also the same registration and price. Go into Settings>GV Phone Extension and enter your credentials. That’s all the setup that’s needed! That’s how to get Google Voice totally integrated into your phone. Your original phone number will still work, but you won’t be able to tell what the difference is between them! If you have the Verizon iPhone 4, I would usually direct you to my post on easy jailbreaking. However, JailbreakMe.com is back! To jailbreak, just go to jailbreakme.com and you’re set from there. Easy! This entry was posted in Apple, Paid Apps and tagged Apple, iPhone, Jailbreak, Phone by Max Swisher. Bookmark the permalink.